Prior to having my family I had worked in administration. As my children were born my interests changed and becoming a Montessori teacher felt like a natural addition to my role as a mother of five children. I was attracted by the peacefulness of the environment, the way the materials engage the senses and the opportunities the children have to explore and make discoveries. I trained as a Montessori teacher through the London Montessori Centre, gaining a Montessori Nursery Teaching Diploma and a Montessori English Language Teaching Diploma. I then opened my own centre in Rotorua, where I have been an owner operator for 18 years. I later gained a Bachelor of Education (Early Childhood Teaching) through the Auckland University of Technology and am currently studying towards a Masters Degree in Education with Auckland University of Technology. I love the opportunity the Montessori philosophy provides to observe and gain a deep understanding of the individual children. It enables me to learn the ways in which they develop their unique understanding of the world around them. I enjoy the special moments when a child makes a discovery that connects with a previous experience, it is like ‘no-one ever knew that before’. I hope that my work as a Montessori teacher will contribute to Maria Montessori’s vision of a more peaceful world. It was a vision of hope that remains just as relevant today as ever. The journey to be a Montessori teacher has offered me the opportunity to learn so much about myself as well as about early childhood. I had struggled with mathematics all through school but when I studied Montessori’s approach to maths and worked with the materials, I developed a “hands on” understanding of concepts I had previously tried to learn by rote. 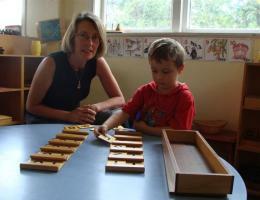 If you are interested in becoming a Montessori teacher, spend some time in a Montessori centre, talk to the Montessori teachers and then go for it! Postgraduate study has provided an opportunity for me to explore research methods and dig deeper into Montessori history and philosophy. I still really love being a teacher in the classroom and as I study further I hope to develop my skills as a research practioner and illuminate what it means to be a Montessori child in Aotearoa New Zealand.